Over the last couple of years, Whitney took her passion of baking cakes and turned it into a business. 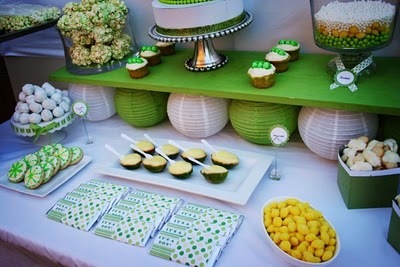 She soon was inspired by some of the dessert tables seen at parties and was dying to try to create one herself. When she found out a good friend was expecting, she jumped at the opportunity to host a baby shower for her. And what a beautiful job she did at it. 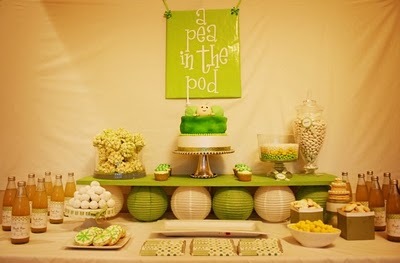 They settled on a pea in a pod baby shower for the theme and Whitney went to work brainstorming a clever and creative party. 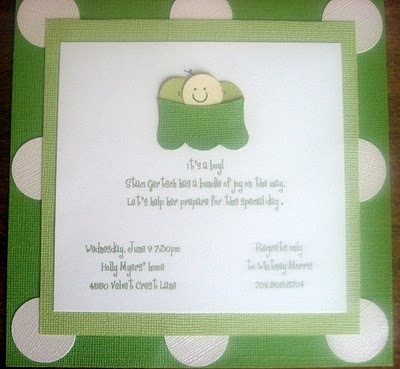 Here is the adorable baby shower invitation they made to go with the theme. So cute!! 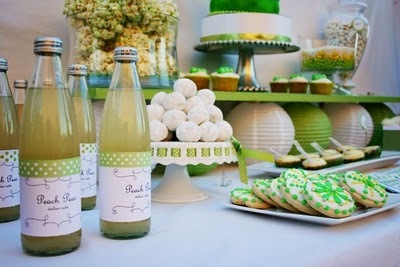 The party was decorated in the colors of green, white and yellow. The highlight was the dessert table. Take a look at it. It is gorgeous! "I bought a thick dowel rod (probably almost an inch in diameter, and cut them all off at the exact same height as the paper lanterns. Then I drilled them into the shelf at equal lengths apart (so that the rods would go exactly through the middle of the lanterns) and placed the screwed in "supports" inside the middle of each lantern. That way it gave the illusion of being supported on its own, but was really much sturdier." What a clever idea! Whitney also made this adorable cake to match the theme. Isn't it cute?! Not only was it cute, but it was also a delicious chocolate cake. 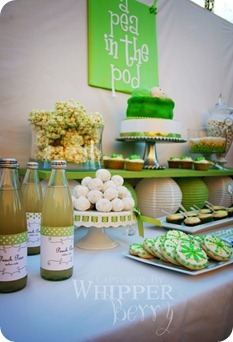 Some of the other desserts on the table were candied popcorn balls, powdered donuts, and sugar cookies. As a delicious treat, Whitney served Jamba Juice in lime shells. She also had cute candy bars in themed wrappers for her guests to enjoy. The cupcakes were lemon with a cream cheese frosting. 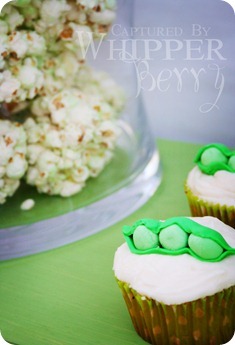 Love the cute pea pods made out of gum paste. The drink labels were a nice and elegant touch. 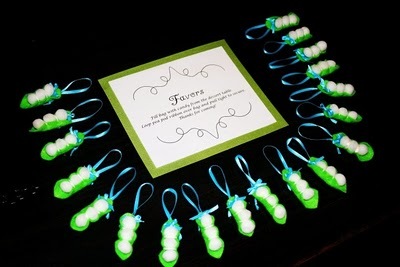 Fill the bags with candy from the dessert table. Loop pea pod ribbon over bag and pull tight to secure. Thanks for coming! I like to hear about "real moments" because often they are things that we all can relate to. Whitney had a "real moment" right before the baby shower started. They had just finished setting everything up when she heard a crash. One of the little kids was so excited by the beautiful treats on the table that (he/she) climbed on it and ended up breaking a few of her dishes. Ugh. I can imagine the stress in a situation like this. But Whitney was quick on her feet and was able to round up some dishes to use from her friends. And she ended up pulling off a beautiful baby shower. Great job Whitney! 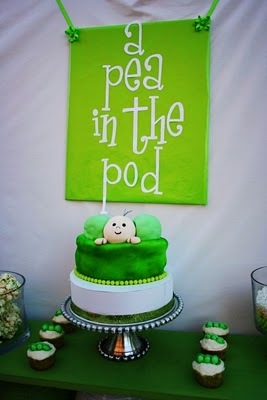 Thank you so much for letting us share your pea in a pod baby shower story! 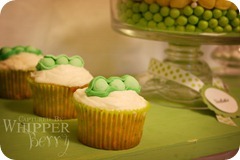 It looks like the bottom layer is green candy balls. 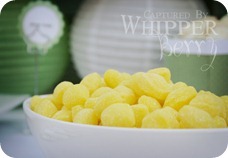 The layer above that is lemon drops and the layer above that are white sixlets candy. Hope that helps! How was the cake made? Do you have a recipe or any tips, it looks fabulous! The table set up looks great too. 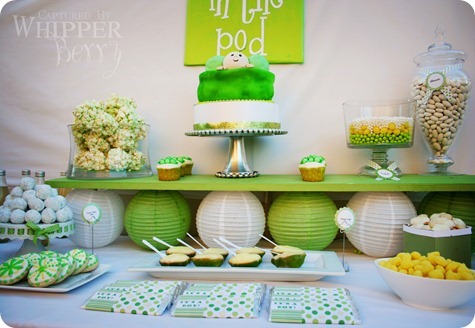 The green and white paper balls/lanterns are a great touch.